Plaque commemorates the death of Private Albert Whitmore, who was the last surviving Light Horseman and last surviving South Australian World War One veteran. 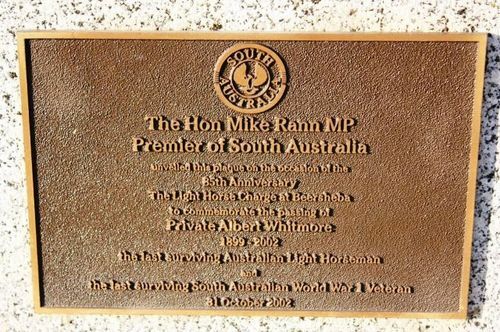 The plaque is affixed to the left side of the Light Horse Memorial. Private Albert Whitmore (1899-2002) was Australia's last World War One Light Horseman and the last surving South Australian World War One veteran. Albert's funeral service took place on the 31st of October 2002, the 85th anniversary of the battle of Beersheba. The Barossa Light Horse Historical Association was requested to provide a section with one horse having boots reversed. The funeral was at Barmera in the Riverland, several hours drive from Adelaide. The section led the funeral procession out of town, then formed up again at the cemetery entrance to salute Albert as the gun carriage carrying his casket passed by. With the death of Albert Whitmore, Australia lost its last living link to the legendary Light Horse that captured Beersheba in World War One. This was history's last great cavalry charge, where Australia's General Harry Chauvel's horsemen captured on October 31, 1917, a strategic water-rich desert town held by Turkish and German forces. Although considered an impossible mission by Britain's commander-in-chief Field Marshal Edmund Allenby, country-born Australian riders succeeded by reaching Beersheba before enemy artillery could be lowered sufficiently to stop them.